REDUCED BY 99,000EUR - JAN 2019 - MUST SELL ! REDUCED AGAIN BY 53,500EUR - MID MARCH ! - FEATURED IN TV SERIES "SURVIVOR"
Liveaboard and Circumnavigation, Sindbad has been our home and life for 27 years during which time we circumnavigated once for 10 years with our two children. We are on our second circumnavigation at present and are currently anchored in Malaysia. Sindbad was originally built as a cargo vessel. We purchased her in Denmark and gradually converted her into a beautiful, comfortable, multi option money making home. 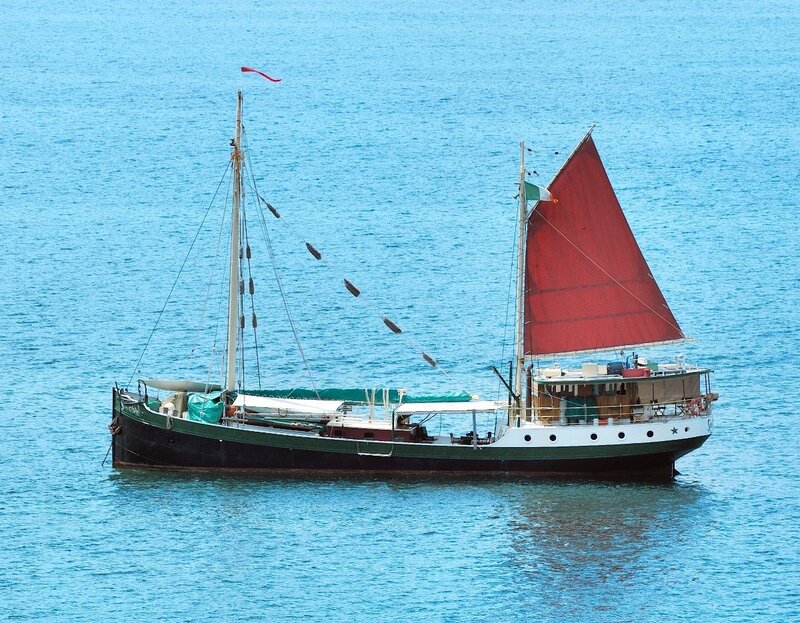 We ran a successful sunset dinner cruise for 30 passengers for five years in St. Martin before deciding to set sail from the Caribbean in 1996; I have used her for salvage work, exploration charters and general charters, a wood working shop, a copper sculpting shop and art gallery. Last year she was chartered and used for an episode in the popular tv series 'Survivor'! Sindbad is more than a fabulous home. She provides an exciting lifestyle full of adventure. At an honest 3 litres per mile she is relatively inexpensive to operate. A 15,000 litre fuel tank gives years of operation, 5,000 litres of water, which we catch from rain and filter. Solar panels enable us to run our 7.5 kw generator for approximately 3 hours every two - three days. The systems aboard are simple, sensible and very efficient. She has a Thrige auto pilot and Svendborg steering gear which has run non stop for 27 years maintenance free. Focsle... One queen size double, one single, settees 2, with table, one sink, large porthole either side. One large cabin amid ships with a queen size walk around bed, private shower and loo, marble counter and sink, 8 large opening, bronze ports. Floor is bamboo laminated new in 2012 varnished. Aft.... One private cabin with large single bed, 3 opening ports, light and airy. 5 opening ports, laminated bamboo hardwood floors new in 2012. Private door to the galley. ( the cargo hold is huge and could easily be converted into cabins). A very functional and attractive galley 16 ft X 6 ft, stand up 230 vac freezer and fridge, Miele, teak galley table /settee plus two chairs, cork floors, Corian Counter, Viking HD stove propane, large enamel sinks and work surfaces. Remodelled in 2013. 4 large opening portholes. Access up stairs to the wheelhouse and another door out to the main, awning covered lower deck area 15 ft X 18 ft... Varnished mahogany table and 10 deck chairs...... Teak ladders up either side of this main deck area up to the poop deck and wheelhouse. One Ships type anchor hurricane 800 lbs. All four of these anchors are in excellent condition. The anchor windlass weighs 1000 lbs and can operate the two chain lockers separately or together if need be. It is in excellent condition, is high pressure hyd. And operates when the Gardner is running. It has it's own clutch for operating. The windlass has a 90 : 1 ratio and also has a hand crank option. One 16 foot fiber and foam, fast runabout. House batteries 24 vdc 440 amp hour. New in 2013. 8 large solar panels which on a good day produce 25 amps @ 24 vdc. Icom VHF new in 2012. The main gaff is steel. Main deck winch forward is low press. Hyd and is driven from a take off on the Gardner. Now it is used to run the wire anchor drum for the big Fisherman and to lift the lifeboat aboard. It also has two drums which we use to put up the mainsail. It's a very solid piece of kit. Of course the heart of this ship is the 8L3B Gardner, which has operated day in and day out for me for 27 years and has never given an ounce of trouble. After two circumnavigations and countless other voyages the engine does not even smoke! It burns an honest 2 litres per mile at 6 to 7 knots. This engine has never let me down and with the superb hydraulics aboard it is the easiest vessel to operate that I've ever owned. I get underway alone quite often.